Desert Flippers is coming back for a third season soon. The renovation series has been renewed for season three this week! Viewers will see 14 new episodes with a premiere this summer. HGTV revealed more about the renewal of this series in a press release. Check that out below. Are you a fan of Desert Flippers? Tell us what you think. 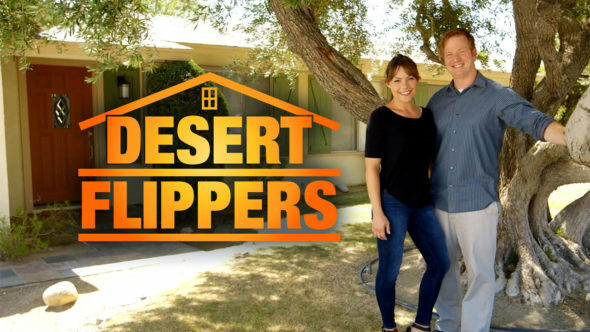 More about: Desert Flippers, Desert Flippers: canceled or renewed?, HGTV TV shows: canceled or renewed? Love this show. So glad it’s coming back. Love the drama free show! This is a married couple with a positive attitude that doesn’t bash one another. Refreshing to watch and refreshing modern colorful creative designs in a beautiful location. Looking forward to the next season and reruns also. These two are a great duo (and Uncle Mike) for this show! No bickering or drama!!!! They make the process of being in chaos while redoing a home look so fun! Their loving interaction with each other is priceless! Love love this show!!! Can’t wait for season 4!!! Can anyone tell me what the name of the “warm gray” exterior paint color is? I’m asking the same thing the others are since they’ve not gotten a reply. WHAT HAPPENED TO UNCLE MIKE? I enjoyed him being on the show as well. I love “Desert Flippers” Lindsey and Eric are so flipping cute together. They give a very real and loving vibe for viewers. I also love uncle Mike, he is great with them and precious with the kidos. I have missed him on the new season. WHERE IS UNCLE MIKE? ?